Table etiquette has elaborate rules, which high-bred ladies and gentlemen must strictly follow. A maid-servant always waits, kneeling, at a short distance, before a clean pan of boiled rice, with lacquered tray, on which she receives and delivers the bowls for replenishing them. Fragrant green tea is always used at the end of a meal, but sugar and cream never. If a man of taste should enter a Japanese parlor he would not fail to be surprised at the display of marvelous and exquisite taste. Yet I have often heard the sayings of foreigners that "the Japanese house has no furniture and is absolutely cheerless and empty." This is quite wrong. I must say that they have no taste of the Japanese art, for the men of taste are agreed in saying that the art of decoration in Japan is excellent. If anyone has some taste in this art, he will perceive that the hanging picture on the toko wall, elaborate arrangement of flowers, pictures on the framed partitions and all decoration, however trifling, reveal infinite taste. The tastes of the Western people differ so much from ours that the decoration in the chambers seems almost childish to the Japanese eyes. The gorgeous display of colors in their rooms would please our children to look at. Drawingrooms piled up from corner to corner with toys, shells stones, dishes, spoons and different novel things always remind us of our curio-shops, a bunch of flowers is stuck in a vase without form and without order. The pictures in the rooms hang perpetually, though the face of nature and feeling of man chance from time to time. All these sights which we are accustomed to see in the European house excite in us nothing but wonder. Yet this is the taste of the Western people; we have no right to criticize it. 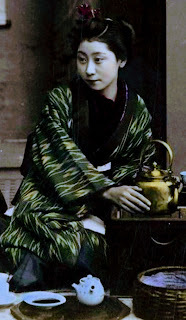 In Japan, the family never gathers around one table as the European or other Asiatic peoples do, but each person has his or her own separate small table, a foot square and a foot high, and always highly decorated. When they take their meals they kneel upon the mat, each taking his table before him. The little lacquered table generally contains a small porcelain bowl, heaped up with deliciously cooked rice, and several lacquered wooden bowls containing soup or meat, and numbers of little porcelain plates with fish, radishes and the like. The way of cooking, of course, is entirely different from the European.